A common theme pervaded the decline of three high-profile technology companies in 2015. What: Shares of FireEye Inc. (NASDAQ:FEYE), TubeMogul (NASDAQ:TUBE), and GoPro (NASDAQ:GPRO) retreated 34.3%, 40.2%, and 71.5%, respectively, during 2015, according to S&P Capital IQ data. So what: These companies ply their trades in widely different sectors of the technology industry. FireEye, a cybersecurity firm, offers both incident management services and threat detection and prevention software. TubeMogul provides brands and advertisers with an enterprise platform to conduct video advertising campaigns. And GoPro manufactures and markets the popular GoPro "HERO" line of video action capture devices. Yet a common thread unites these wayward stock tickers. Each caught a wave of investor enthusiasm because of phenomenal growth prospects, and each subsequently plummeted in 2015 when shareholders realized that the potential for revenue expansion was either overstated or fraught with unanticipated complications. As the broader market cooled during the summer of 2015, technology stocks with high price-to-earnings and price-to-sales multiples were abruptly reassessed by previously sanguine shareholders, who were apparently prompted to second-guess valuations by a sense that the multi-year bull market in U.S. equities may soon be ending. FireEye serves as a cogent example of this process. The company started out the year valued at roughly 6 times forward one-year sales. This multiple is steep, but not beyond an acceptable range for a company that has routinely posted year-over-year quarterly revenue growth of 40%-50% since going public in September 2013. Indeed, FireEye's third-quarter 2015 earnings revealed a top-line increase of 45%. Yet billings, a measure of total revenue minus changes in deferred revenue, rose at the slower rate of 27.5%, indicating possibly weaker growth ahead for the company. As a result, FireEye stock, which had already given up its gains for the year by summer's end, plummeted in the last two months of the year. And that steep P/S multiple was effectively cut in half by Dec. 31, to under 3.0. TubeMogul is another tech upstart that built up stock price momentum by exhibiting quarterly revenue leaps. In late February 2015, the company reported fourth-quarter 2015 earnings punctuated by sales that climbed 64% against Q4 2014. Yet investors questioned the logic of the company's sales gains, as investments in R&D and sales and marketing pushed the quarter into a loss versus the prior year. The "TUBE" ticker skidded 31% in the two days after its earnings release, as shareholders delivered a message that rapid growth at any cost wasn't a viable outcome on the organization's profit and loss statement. A secondary stock offering completed in June 2015, just 11 months after the company's IPO, further displeased investors, and consequently TubeMogul stock tumbled another 15% during June. A sense of injury also seemed to characterize GoPro shareholders, who were initially enamored with the video camera manufacturer's early lead in the video action capture device market. Yet a series of questionable product decisions by management changed GoPro's trajectory in the space of only two business quarters during 2015. In the third quarter, GoPro launched the HERO4 Session and HERO+ models, rather than introducing the long-awaited HERO5 extension of its brand. The HERO4 Session was priced at $399, creating confusion as it competed directly with the company's extremely popular HERO4 Silver model, also priced at $399. Disappointing sales caused management to cut the price of the Session twice, to a final $199 sales tag -- the same price as the newly introduced HERO+. Are you confused yet? Consumers were too, as it appears that without a truly new generation of HERO devices to bring the market, the company resorted to what turned out to be self-cannibalization during the last few months of the year. Because of these missteps, rather than incurring simply a decline in its top-line revenue growth rate, GoPro has now forecast a negative revenue trajectory of more than 31% for its upcoming fourth quarter results. In mid-January, the company issued a warning that fourth-quarter 2015 revenue will decline from the $634 million booked last year, to an estimated $435 million. Now what: While it's early in the year, of the three companies, TubeMogul seems to have the clearest route to redemption in 2016. TubeMogul reported solid revenue growth in the third quarter of 2015, and management indicated progress on the bottom line by raising full-year guidance on both gross profit and EBITDA (earnings before interest, taxes, depreciation, and amortization). 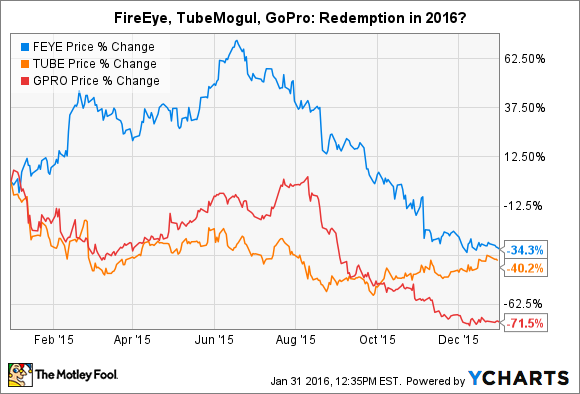 In the overall weak stock market environment during the first weeks of 2016, TubeMogul has declined 12% year to date, which is relatively benign, when compared with the further stark deterioration of FireEye (down 32% year to date), and GoPro (down 36% year to date). Is it time to buy any of these companies? Investors with a value bent who are interested in a potential bargain purchase will soon have more data to inform a decision; all three companies report fourth-quarter and full-year 2015 earnings this month.